If you would like to transfer your domain so that it is managed through Yola, then this is the tutorial for you! If you are looking for information on pointing your domain to Yola and not transferring it, please follow the steps on this link: Publish to a domain you already own. Unlock your domain at your current registrar. Choose your hosting package: Yola packages. Please note: We currently only offer the facility to transfer .com, .net, .biz, and .org domains to Yola. If you do not have one of those domains, you can always point your domain to Yola. Your domain needs to have been registered for more than 60 days for it to be eligible for a transfer. It must also not have been transferred to another registrar within those 60 days. Make sure you can access the email address originally used to register your domain. Our domain registration partner, OpenSRS, will send a confirmation email to that address once you begin the transfer. You will need to get an EPP or authorization code from your current domain registrar. Check that your domain is unlocked. To find out if your domain is unlocked, look it up on www.who.is. If the Status is described as "ok" then it is ready for transfer. If the Status is "clientDeleteProhibited" then the domain is still locked. Please remember to remove "privacy" from your domain's settings. During the transfer process, your domain will not be available online. In the interim, we encourage you to publish your site to a subdomain. Once the transfer is complete, you can add your custom domain to your published site. Take a look at these two tutorials for more information: Publish your site to a subdomain and assigning domains. 1. Log in to your Yola account. 2. Click Domains along the top toolbar. 3. Under "Add a Domain you already own", click Purchased a domain from another registrar? Transfer it to Yola! 4. Click Transfer a domain to enter the transfer steps. 5. Enter your domain and select which site you would like it assigned to. Our domain partner OpenSRS will send an email to the address you used to register the domain. When you receive this email, please follow the instructions authorizing OpenSRS to transfer the domain. This is done to protect against fraudulent transfers. OpenSRS will then initiate contact with your current domain registrar to transfer the domain. You will receive an email when the transfer is complete. Please note: The complete transfer may take between 12 - 14 days. 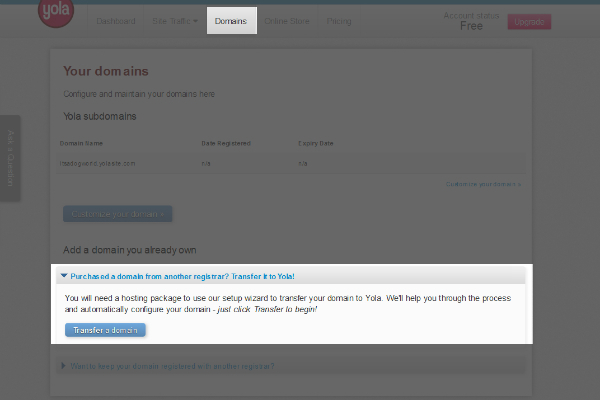 Once the transfer is complete, your domain will show up in the "Domains" tab in My Yola. The cost to transfer your domain is the same as purchasing your domain for one year. 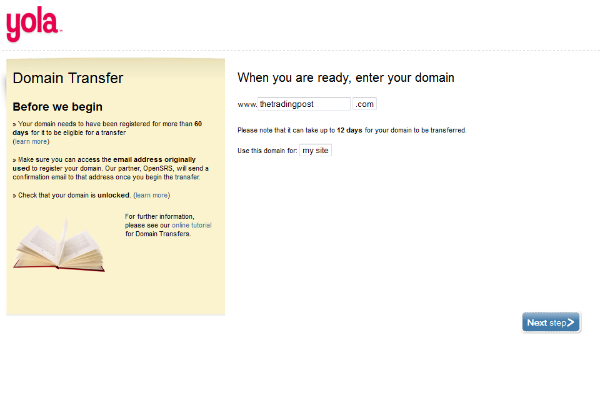 For example, transferring a .com domain to Yola will cost $11.95. For a list of our domain prices, click here: Domain Pricing. You can also elect to register your domain for an additional period of time. 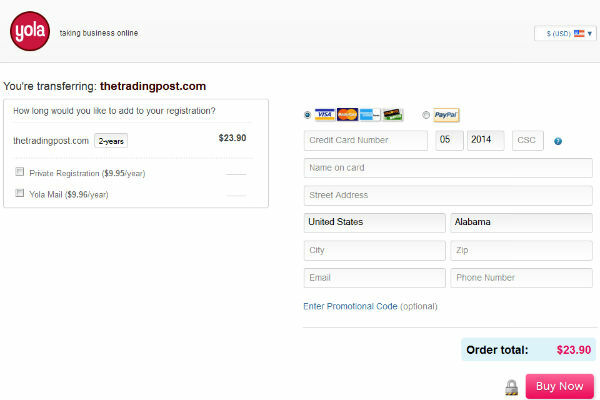 Once you've entered your details, click Purchase. Your payment will be processed and you will receive a confirmation email from us. What types of domain name extensions can I transfer? We are able to accept .com, .net, .biz and .org domain names only. What happens to the email addresses I had already setup with my previous domain host? If you have existing email addresses setup, they will stop working when the domain has been transferred. You will be able to reinstate your email addresses by following our tutorial: Tutorial: Creating email addresses with your domain purchased from Yola. What if the transfer fails, what do I do next? You will receive an email from us asking if you would like to retry the transfer or if you would like to receive a refund. If I don't hear anything for more than 12 days, what do I do? Send an email to support@yola.com with the email address you use to login to your account on Yola as well as the domain name you are trying to transfer. Once the domain is transferred, will my site be published and live on the internet? Yes! When you start the transfer, you choose which of your sites you'd like to have published to the domain. Once the domain is transferred, your Yola site will be automatically published to that address. You will be able to view your site by typing the address into the address bar in your browser. When my domain is hosted with Yola, do I get access to the DNS settings? Yes! For more information on managing your domain's settings, please take a look at this tutorial: Tutorial: Managing the domain you bought from Yola.